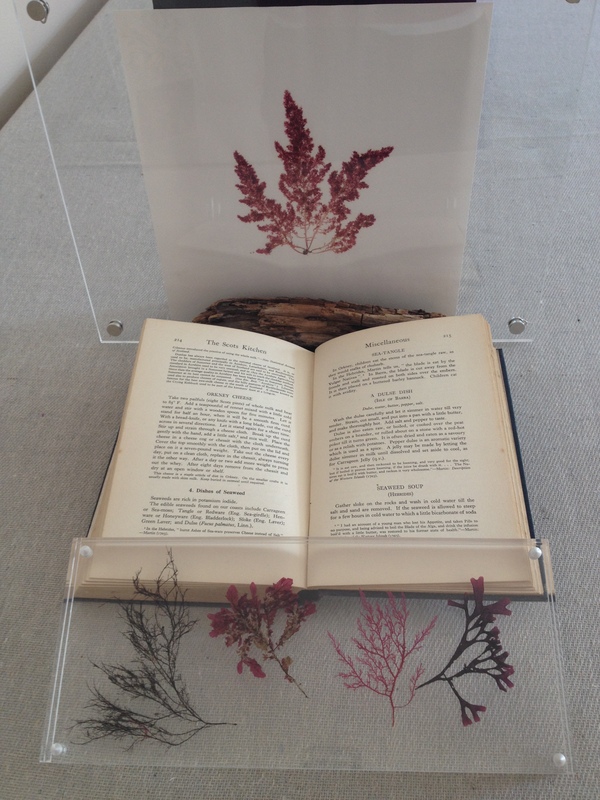 We had a wonderful day with the Royal Botanic Garden’s Post Graduate Diploma in Herbology class playing with seaweeds. The class all came down from Edinburgh on the train and we took over North Berwick’s Hope Rooms, by the shores of the West Beach. We had perfect low tide conditions, and deep pools of seaweeds, starfish and anemones to play in. A very wet afternoon ensued as the group found their pace laying out and pressing some beautiful specimens. I look forward to seeing the results at the Graduation Show in September. The rock pools of late Spring and early summer are alive with colour. Sometimes though, deep in the clear water of still pools, you can catch the fading hues of winter glowing through to create stunning compositions of tone and texture. These images were taken at mid-day of barnacles bunched along the tide lines of the blue-green stone reefs reaching out into Ravensheugh beach at the edge of the John Muir Country Park, East Lothian. Seaweeds are rich in potassium iodide. In Orkney, children eat the stems of the sea-tangle raw, as they would stalks of rhubarb. In the Hebrides, Martin tells us, “the blade is eat by the Vulgar Natives”¹. In Barra, the blade is cut away from the fronds and stalk and roasted on both sides over the embers. It is then placed on a buttery bannock. Children eat it with avidity. ¹ “I had an account of a young man who lost his Appetite, and taken Pills to no purpose, and being advised to boil the Blade of Alga , and drink the infusion boil’d with a little butter, was restored to his former state of health.” Martin Martin: Description of the Western Islands (1703). Carrying on this tradition, I understand that Fiona Bird of South Uist is following her wonderful book,The Forger’s Kitchen, with a new arrival in April called Seaweed in the Kitchen, promising to restore and revive both the tradition of cooking and eating seaweeds and of saving recipes for future generations.